Our little boy was a healthy, happy three-year-old until September 2013. Our lives then changed forever. 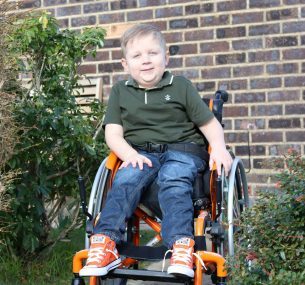 Blake wasn’t well – his symptoms included severe night-time headaches, spontaneous vomiting, tiredness, strange eye movements and a stiff neck and back. We had numerous visits to our GP and were told he had a virus – or that he was attention-seeking. As Blake’s parents, we knew it was something more serious. We did some research and his symptoms seemed to point to a brain tumour. We demanded an MRI scan and, after much convincing, Blake got his scan. After an agonising three and a half hours we were taken to a room – the doctors said they had some concerns. Straight away we knew. The oncologist explained they had found a tumour in Blake’s brain. He needed to be transferred from Poole to Southampton for emergency surgical debulking of his tumour. A further MRI in Southampton showed the tumour had spread down his entire spine, encasing the spinal cord. Our lives just stopped. Blake had a two-year-old sister and another on the way. We were told Blake only had a few weeks to live. 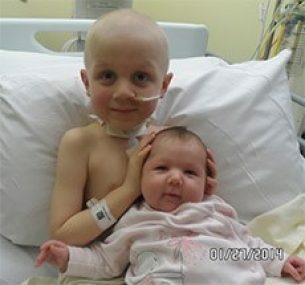 The cancer was a Stage 3 Medulloblastoma – a very aggressive, fast-growing cancer. Four days after the operation we noticed he wasn’t moving his legs. Blake was paralysed from the chest down. We had to make the decision to consent to high dose chemo 72 hours after the surgical debulking. It would normally be given three weeks after the operation. We were told this had never been done before and that it may kill him. We consented. The months that followed involved more chemo and four months with Blake being in intensive care on breathing machines, being intubated and then undergoing a tracheostomy to help him breathe because of his paralysis. We nearly lost Blake a couple of times, but our persistence and Blake’s zest for life and to live just shone through. We made it home for short periods, which was amazing. 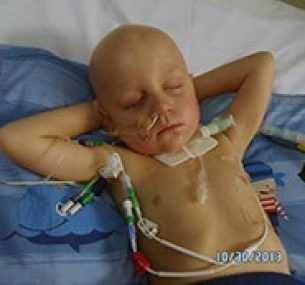 We were advised not to go ahead with the six-week radiotherapy which was on the protocol, as the oncologist said Blake had a high chance of not making it through. Again, we pushed for him to have it. Blake had to have a general anaesthetic five days a week for six weeks. He survived it, and it didn’t even faze him. Although his MRI scans have been very good, the type of cancer he has is predicted to return aggressively. The oncologists hold little hope for Blake’s life expectancy. We are more optimistic – Blake is the most amazingly strong, beautiful little boy, and he will beat this! Blake has now had disease stability for nearly a year and a half. He is enjoying school and time with his friends and family – especially his new eight-week-old brother. 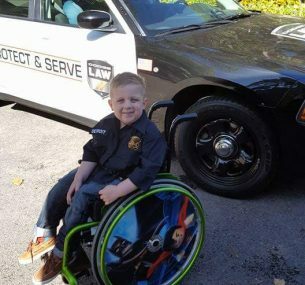 Blake is fighting this with all he’s got – a true amazing superhero! 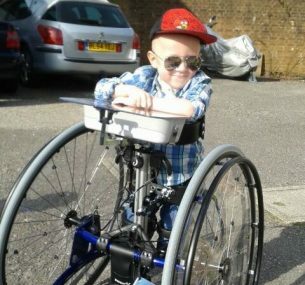 Blake had to cope with a lot of changes: being in a wheelchair, losing his hair, being in hospital, having a tracheostomy and catheter and feeding tube as well as a central Hickman line to administer the chemo. Regular MRI scans showed that the radiotherapy and chemo were working and that he had defied all the odds. The disease was shrinking and by June 2014 he was in remission! 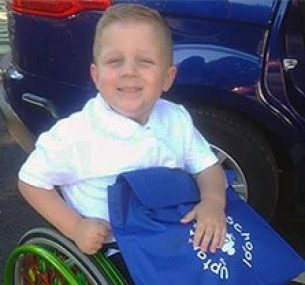 Blake even started school in September 2014, while still receiving maintenance chemotherapy. It has made me look at life in a new light, to appreciate what I have and take each day as it comes. I know too well that anything can happen around the next corner. Blake still has disease stability. The long-term side effects of radiotherapy and treatment are becoming more apparent now. He has been very brave and mature coping with his daily struggles. We are immensely proud of Blake.